This is my version of a quick and easy comfort food. I can't take credit for it since my soon-to-be stepmother introduced me to this recipe. But, I have cooked it many, many times since. If you love sausage and potatoes (as I do), you NEED this recipe. It's ridiculously easy. Just thickly slice an onion, a few potatoes, and 1/2 a sausage link. Spread 'em out on a cookie sheet, season to your liking and pop it into the oven for 30-40 minutes. Add a side salad and you've got yourself a rounded meal. Prep work and time for assembling the salads: 5-10 minutes. Now, go enjoy yourself while the oven does all the work! Maybe that involves relaxing with an alcoholic beverage. If that's the case, sausage and beer were meant for each other. And, since it's September, a few seasonal Oktoberfest beers have probably shown up at your local liquor or grocery store. Of course not everyone enjoys malty beers. If you prefer a heartier, hoppy beer, try a good IPA. There are loads out there! Kielbasa sausage, yellow onions and yukon gold potatoes all cut & seasoned, ready for the oven. It only takes minutes to prep this comforting roasted kielbasa sausage, potato and onion dish for the oven. Spend less time cooking and more time enjoying a good beer. 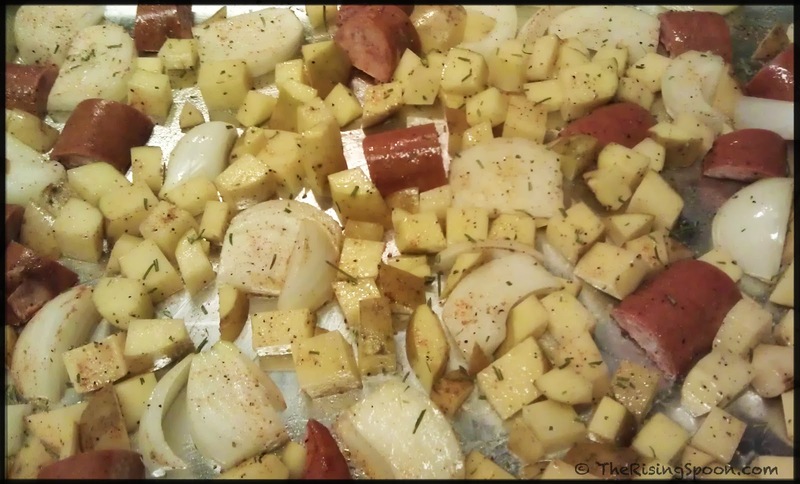 Cut up sausage, onion and potatoes and place on a large baking sheet or roasting pan. Drizzle with extra-virgin olive oil, salt & pepper, garlic powder, and rosemary. I always add ground red pepper and heavy handed measurement of whatever seasoning blend I'm using, but those are optional. Mix everything around with your hands so every bit has seasonings and olive oil on it. Bake for 30-40 minutes. Flip the sausage and stir the potatoes/onions after 15-20 minutes, or if you forget, it's no big deal. Everything should be done by the 30 minute mark, but stick a fork into the potatoes just to be sure. (If you cut the potatoes into larger chunks, it may take longer to cook.) If you want the sausage a bit crispier (how I prefer it) keep it in for another 10 minutes. When it's done, season with more salt and pepper to taste. Eat it as is or dip the sausage and potatoes in your favorite BBQ sauce. 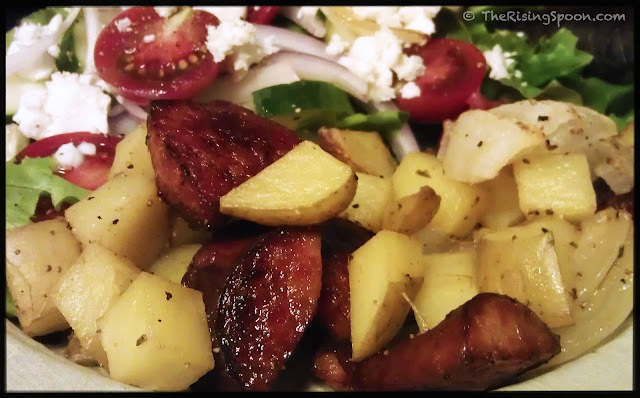 Make it a rounded meal by adding a side salad. My favorite is spring mix topped with sliced red onions, cherry tomatoes, cucumbers, goat cheese and spicy maple balsamic vinaigrette dressing. You can use the leftovers in scrambled eggs or a frittata the next morning. Throw it in a pan to rewarm, then add the eggs and whatever else your belly desires. Question for Discussion: What's your favorite way to fix kielbasa sausage?